Delightful! I love Puffins! We see many Cormorants on the river near our home. They like to dry their wings on the wire netting that keeps our swimming baths safe from sharks. Thank you for your comment, Margaret! I have learned so much from it. The protective wire nets is something I have never heard about 🙂 I love to learn from other bloggers about the life in their land. We have Cormorants too, but they are always at some distance. 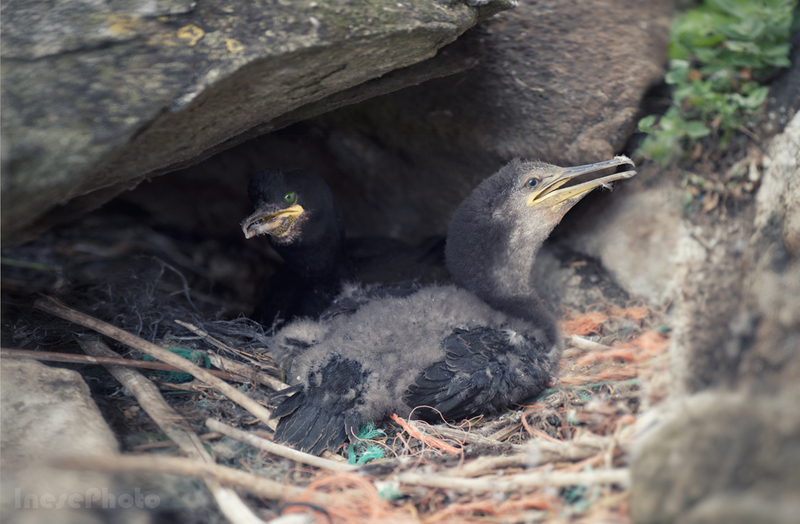 European shags living on the island let me come very close. Your seagull photos are so unique with the ringed wings seagulls beautiful in their uniqueness. Thanks for the lovely photos. I hope the fall did not douch harm. Thank you so much! Glad you like the pictures. Your photos are so beautiful and vibrant, Inese! I love your vision! I think you are doing a wonderful job when showing us the beautiful things that surround us and of which we forget sometimes. Thank you so much, Mihaela! You know and appreciate beauty in everything. Awww.., I love the first image so much! You captured the spirit, or should I say, the shyness of this little fellow! He might be shy but elegant too! Thank you so much! Yes, elegant and very quiet. He doesn’t hiss like his mother does when we walk past their rock. I call him Little Prince. How sweet! Each has different ‘personality’, just like us! Marvelous set of images that show nature’s charming creatures. Those are awesome photos! 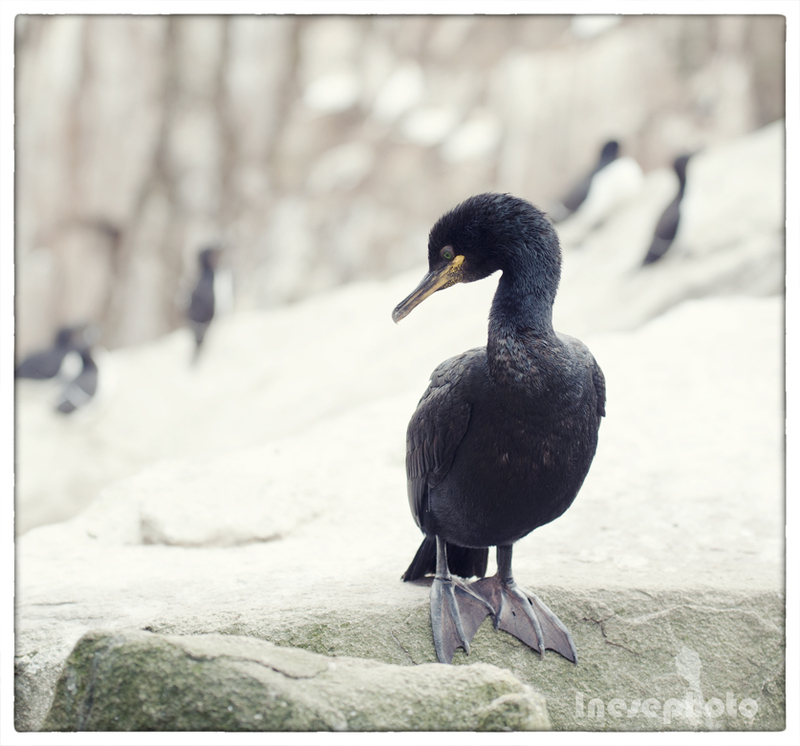 The name “shag” is so sauve! Thanks so much for even more fantastic images of the islands and for taking us with you. I’m terrible at taking pictures so this is an excellent second best for me. Have a good trip. I’ll be thinking of you and your family. Thank you Olga! God only knows how I am afraid of flying. This face is much more attractive than many human faces the media makes us see every day. Such beautiful scenery and lovely gulls and cute Puffins. So glad you weren’t hurt in your fall! Than you Linda! Good I didn’t fall off the wall. It wouldn’t fun at all. I, too, am glad to know you didn’t injure yourself, Lady Inese! 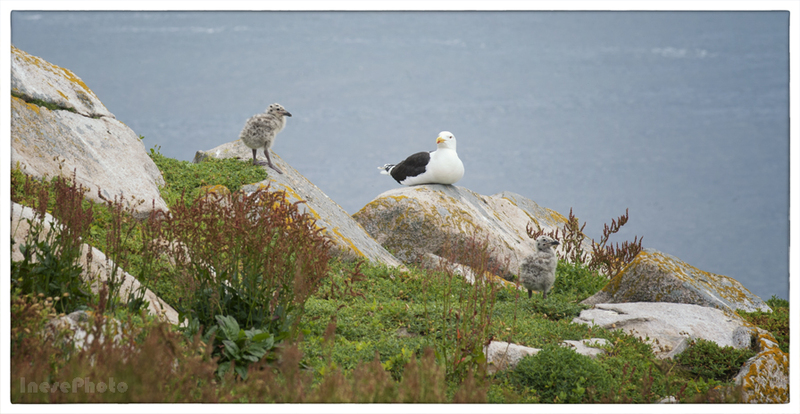 Saltee Island certainly has a nice assortment of birds. 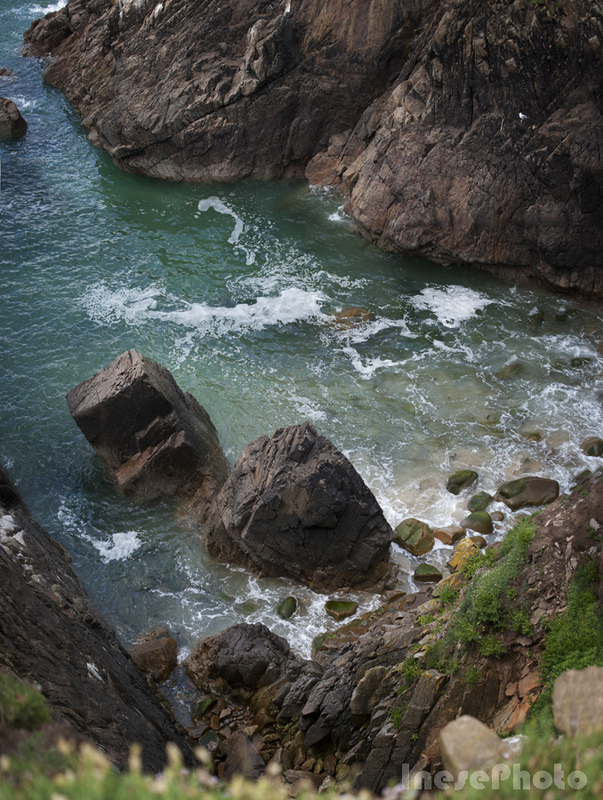 How many hours did you spend traversing the island? You must have been exhausted afterwards! 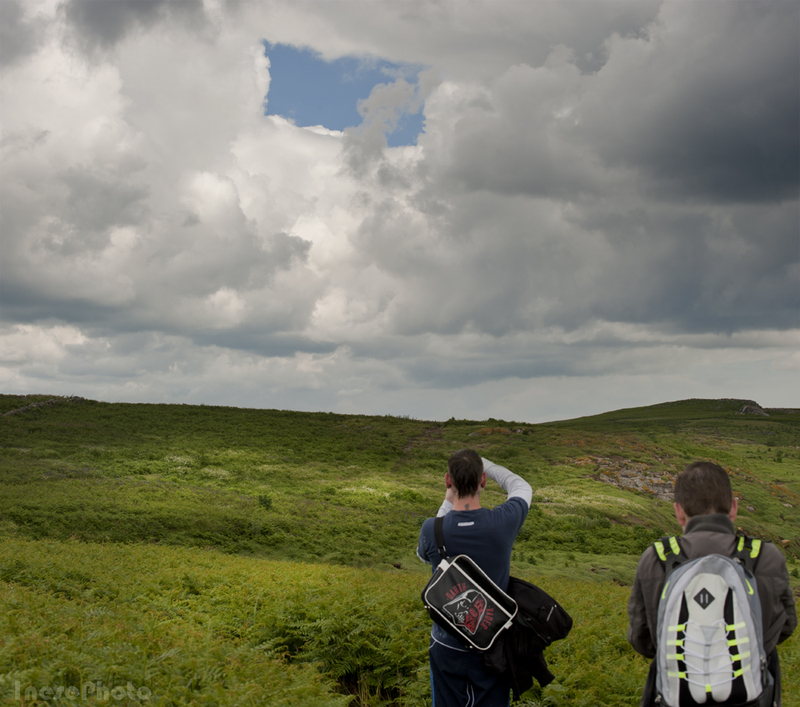 Such a full and glorious day, and good thing you took all those lovely shots before it rained. Thanks for the lovely photographs, and I look forward to reading more about your adventures next Saturday! Thank you so much for stopping by, Dead D! I had spent five hours on the island. 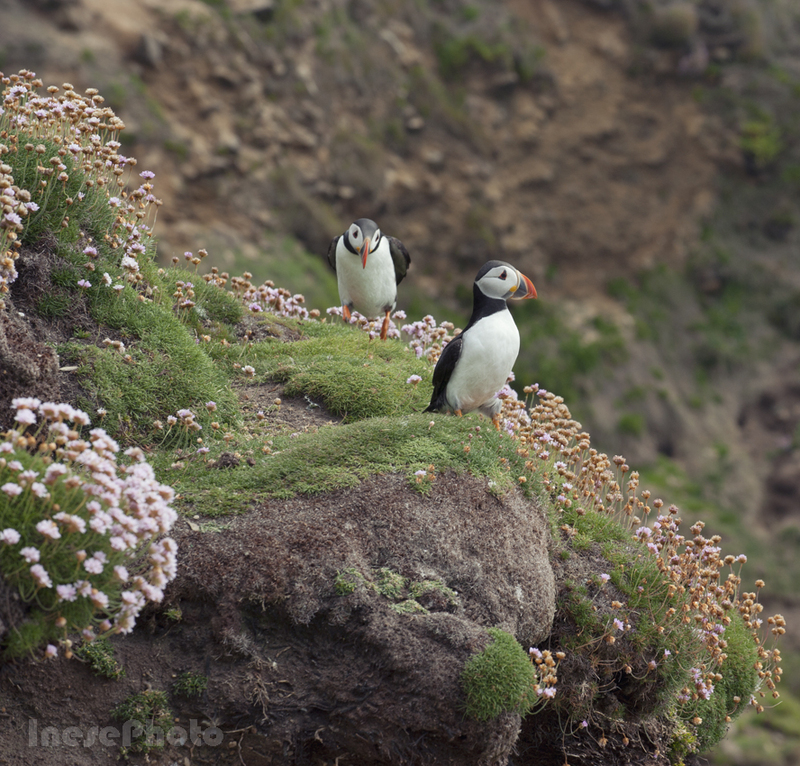 I wish I were there right now, perching at the edge of the cliff in a company of puffins instead of packing and thinking about horrible flights and crashes. Thank you so much again, you are so sweet. 5 hours in paradise sounds great to me. Hey, have a safe flight! You’ll be fine — just think of the Puffins, and that should make things more bearable. Bon Voyage, Lady Inese! Thank you so much! I really needed encouragement. Talk to you later on! Sorry! Haha — how embarrassing; I accidentally got on Poet Rummager’s account. It’ll be our little secret. Oh, I have no worries about you, dear. 🙂 Thanks much! I’m glad you were all right from your fall! It’s a good thing you don’t venture by yourself during these escapades. 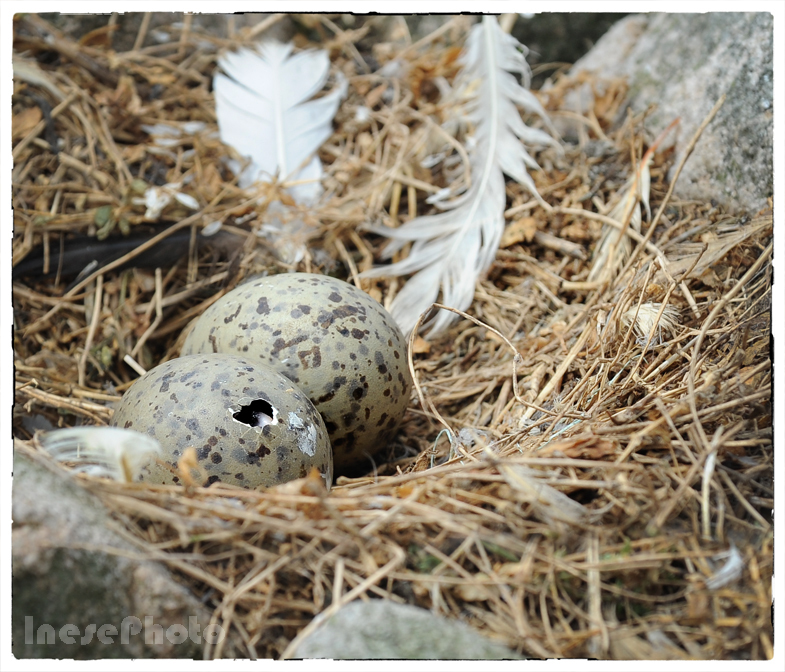 I’d never think to eat Seagull eggs — who in the world would make such an effort to find the nests and then steal them from the poor mother? Thank you so much, Rose! The fall was rather comical than dangerous. I am still laughing at myself stuck between the rocks 🙂 I wish everybody had a chance to visit a bird sanctuary. It is like a different world. I was in shock about the eggs. 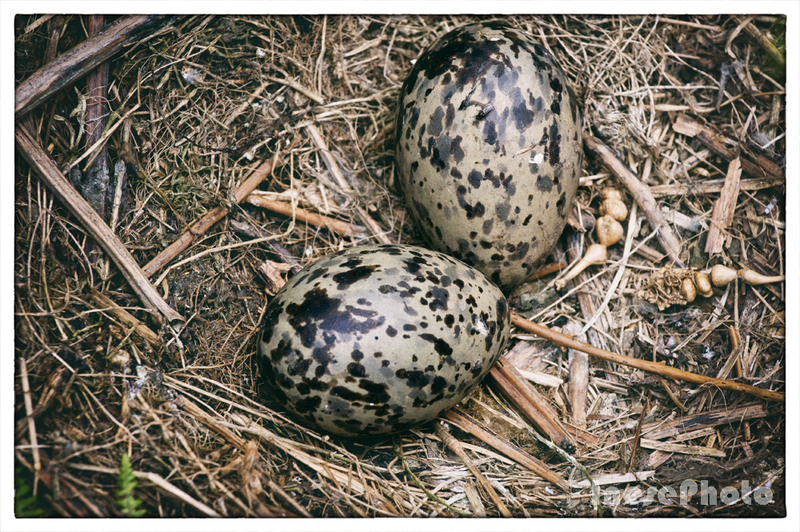 I just wanted to google and match my photographs to a certain bird, but the ‘seagull eggs’ search gave me links to these cooking pages. I have never understood people who eat such stuff if they are not starving. Don’t we have enough farms? I’m glad your fall was only comical! 😀 I agree with what you’re saying about the birds. I believe that your posts about animals help others see their beauty and value. Although not everyone can have the opportunity of visiting a bird sanctuary, your photos and words are the next best thing! I say thank you again, dear Inese — I believe you’re doing so much more than you realize in helping these beautiful creatures. Thank you for stopping by, Bun! I think that the record is 49 years, actually. Puffins can live 20- 30 years too 🙂 In captivity they might live even longer. It is what I have read. 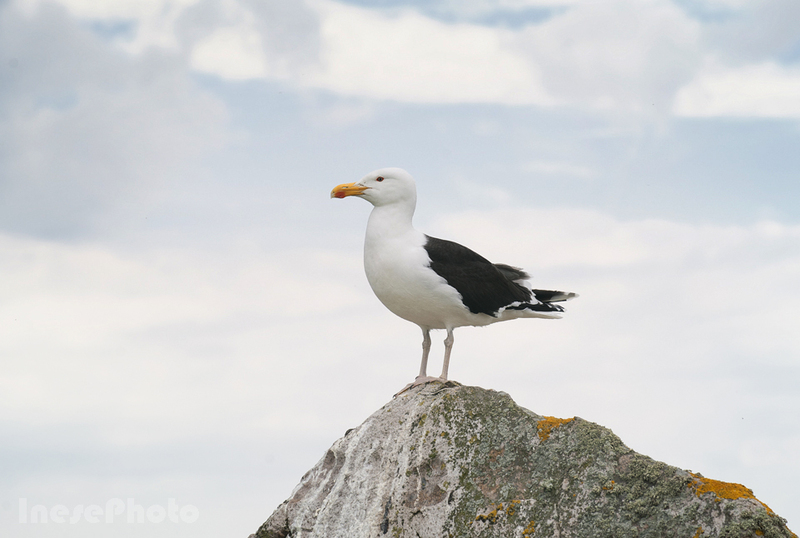 Hey, if I were a herring gull, I’d be right on the cusp of breaking the world record! Inese, wonderful pictures, as ever. I can almost smell the salt in the air from looking at them. That island looks so clean. The seagulls are making a great deal of noise outside my window, as I’m typing this comment. I think bad weather is on the way. Here’s the link to a photo of a seagull on my garage roof, with accompanying haiku. From what I remember, we hadn’t linked up in Blogland when I posted this one. 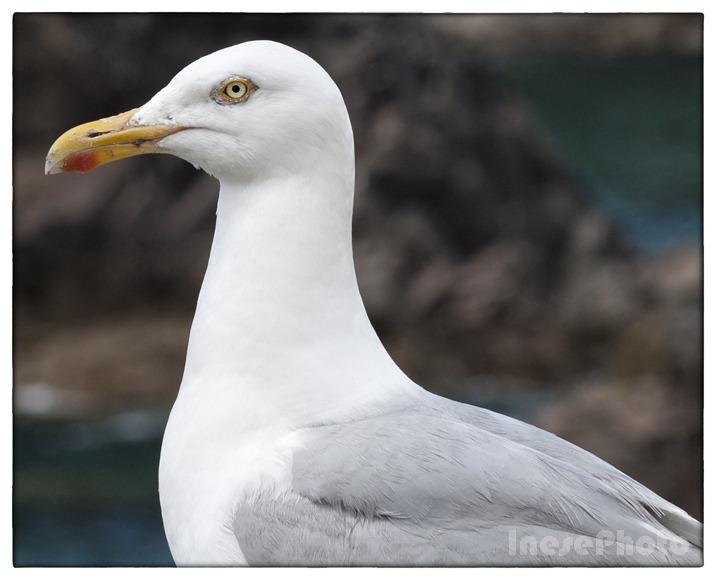 https://sarahpotterwrites.com/2014/05/26/monday-morning-haiku-15/ If you’ve time to type “seagull” in my search box, you’ll find many more related posts that you might enjoy. I too have a small colony of seagulls living nearby. I don’t see them ‘fishing’ in the garbage bins, so I think they do it in the river, just a minute walk from my house. Thank you! 🙂 Puffins are my favorites too. Saltee Island does not disappoint! Neither does your photography. A nice collection of photos! Thank you Seb! Welcome back! Inese, Your photos and commentary take me along with you as you photograph the beauties of the world we live in. Thank you for sharing. Inese – it refreshes my sense of beauty and good in the world when I read your blogs. Your photos are stunning and your country – one that Tom and I always thought we’d visit. We both love the history and we still ask ourselves how we missed out on the experience. Sheri, I will do my best to post photo-stories about Ireland. We cannot lose our connection with the beautiful things of the world. Everything else is temporary. What a visual treat you have given to your readers. Hope your bum is better. I would be delighted. The place is a gem! Love your bird pix! They do seem to have a lot of personality! And love your Puffins! Millie, thank you, it was not painful at all 🙂 I slipped and just sat on my bottom that very conveniently lodged itself between two rocks 🙂 Then I couldn’t stand up because my feet couldn’t touch the surface of the wall. The situation was more comical than dangerous. The chick in the egg made my day. I have never witnessed anything like that. A miracle of life. 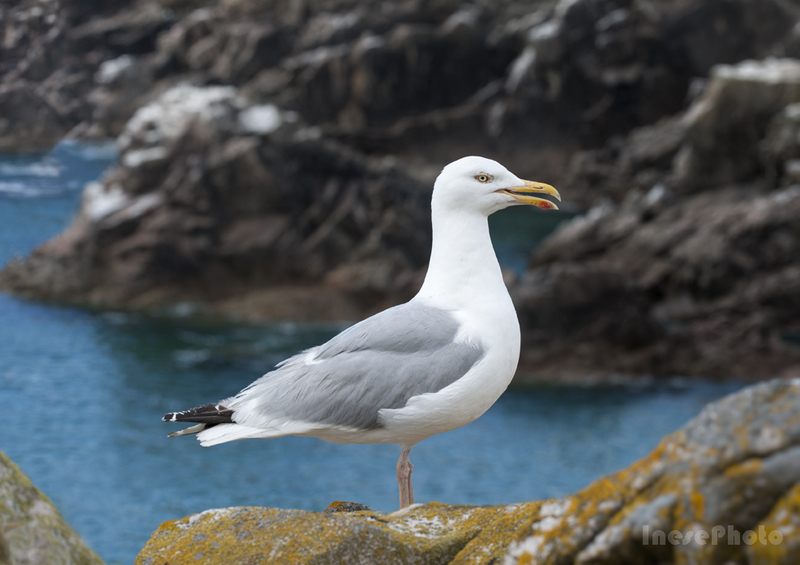 Herring gull has always been a pest everywhere, but the latest improvements in waste management cut off their main food source. I think it is the reason that general population of these gulls has declined. Did you see it too? It was my first time, and I was in awe. Yes, I did and I understand what you feel, quite amazing! Francis, are you writing something? I didn’t see any new post in your blog for a while. Always lovely to have you visiting, and I appreciate your comments. Great pictures – especially that last one. What a cutie. The amount of ground you cover both on your adventure as well as in this post is admirable 🙂 The Saltee Island has so much to offer ~ is it possible to also camp there as well?!? It must be beautiful to experience ~ and while all your photos stand out, the one of the gull posing so elegantly (seagulls really are photogenic), it is your last photo of the Puffin that makes me again dream of being on those shores you just described (lost or not!). Cheers to a great Sunday. It would 🙂 I thing it could be arranged if you don’t lit a fire. With your photos and words — this is a beautiful adventure, Inese. But what a dangerous fall. I’m so glad you weren’t hurt, or alone. Not as exciting as an ancient rock wall or cliffs, but I’ve fallen down my stairs several times (three different flights), and last time (the brick stairs outside) I was lucky to be alive… So I really understand what you said about how you would have felt if you’d been alone. It’s frightening. I’m amazed that the Herring gull lives so long. I only knew about the very long lifespan of parrots. Interesting. And so very charming about the puffin running toward you. Thanks very much for this delightful journey. Mega hugs. Teagan, thank you for your kind comment. The fall wasn’t bad, I was still on the wall, just slipped and fell back, and my bottom stuck between the rocks, and I couldn’t move. Didn’t hurt anything. If I were alone, I would have to turn onto my side and slid off the wall. It would take time though. A good lesson learned ( hopefully). I am off to your blog. We have a street festival going on, so I am in and out today. Many hugs!!! 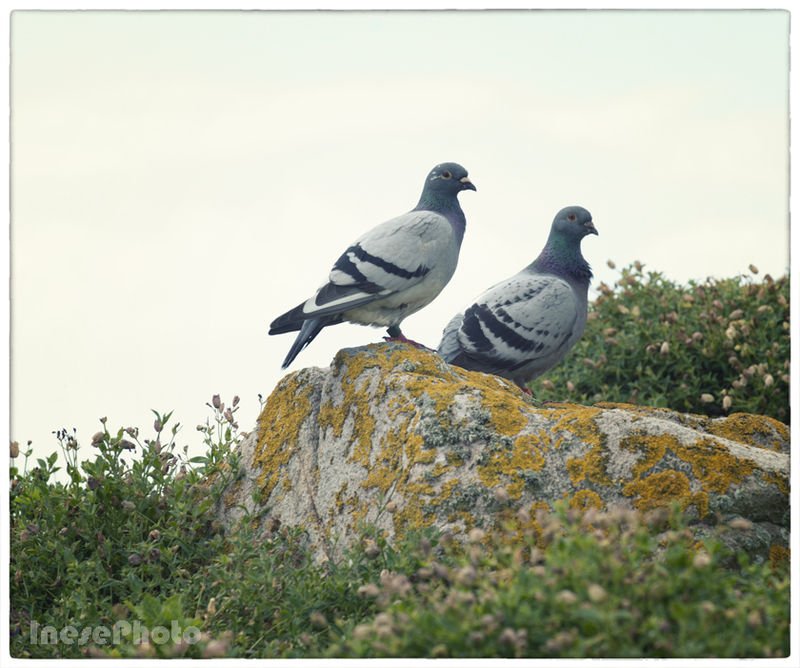 I especially liked the photo of the ringed pigeons….and that rectangle in the sky? It makes me think of word etymology…”rect” being from Latin meaning “right”….keep to the right path? It will all turn out all right? A beautiful journey, as always, Inese. Ms Inese … awesome photographs! 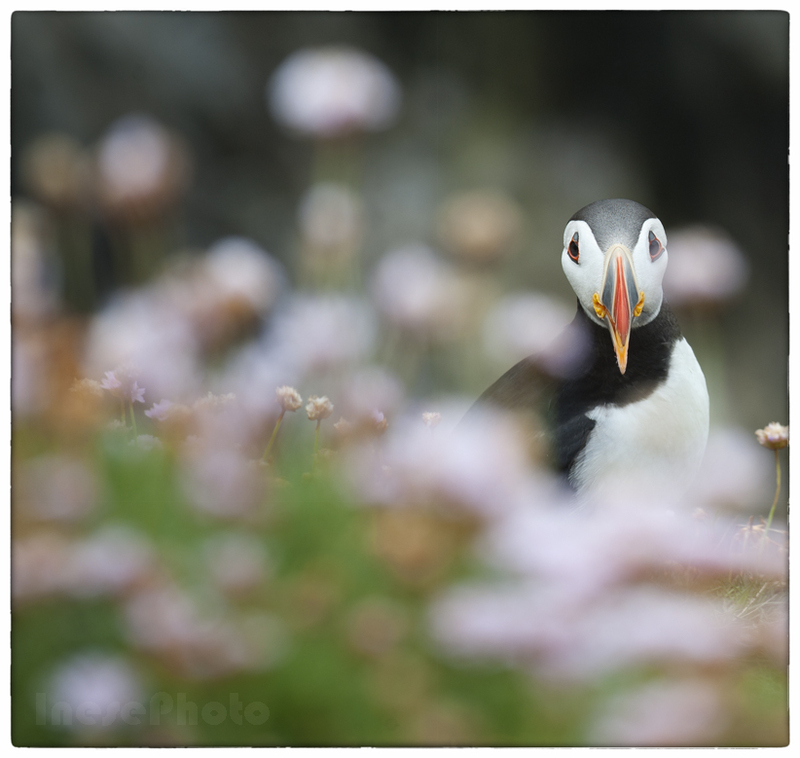 I just love these photos of the puffins. They are so beautiful. 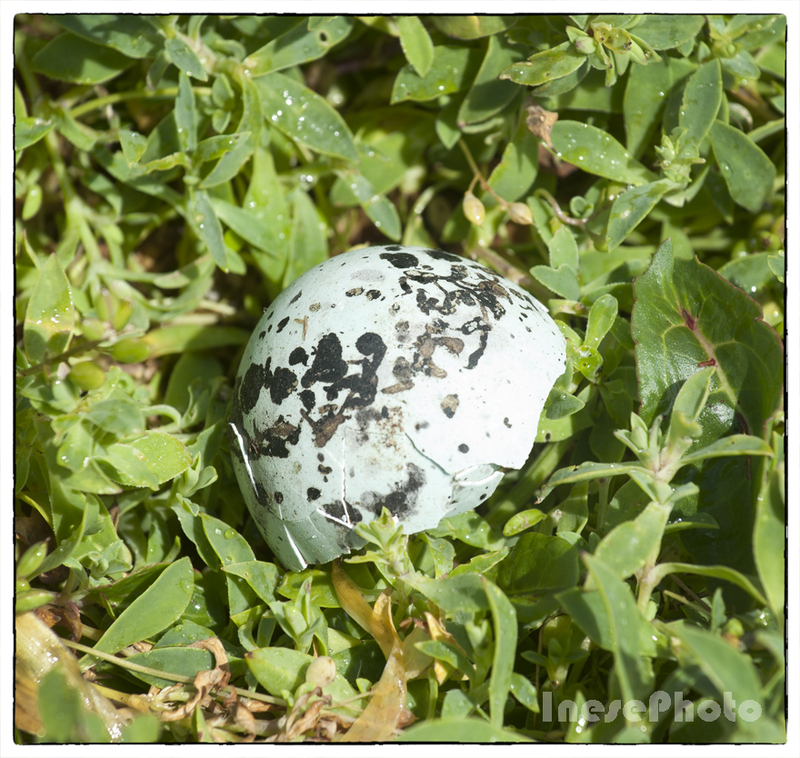 You captured some nice shots of the unhatched eggs. Thank you so much! Did you see the chick inside of one of the eggs? I have never seen anything like that before. A miracle of life. Thank you so much, and I wish I could stay there and see the chick emerging out of the egg. The egg tooth is visible in the hole if you have a closer look. This is a little adventure that I enjoy and learn few things. I have not seen eggs galls. 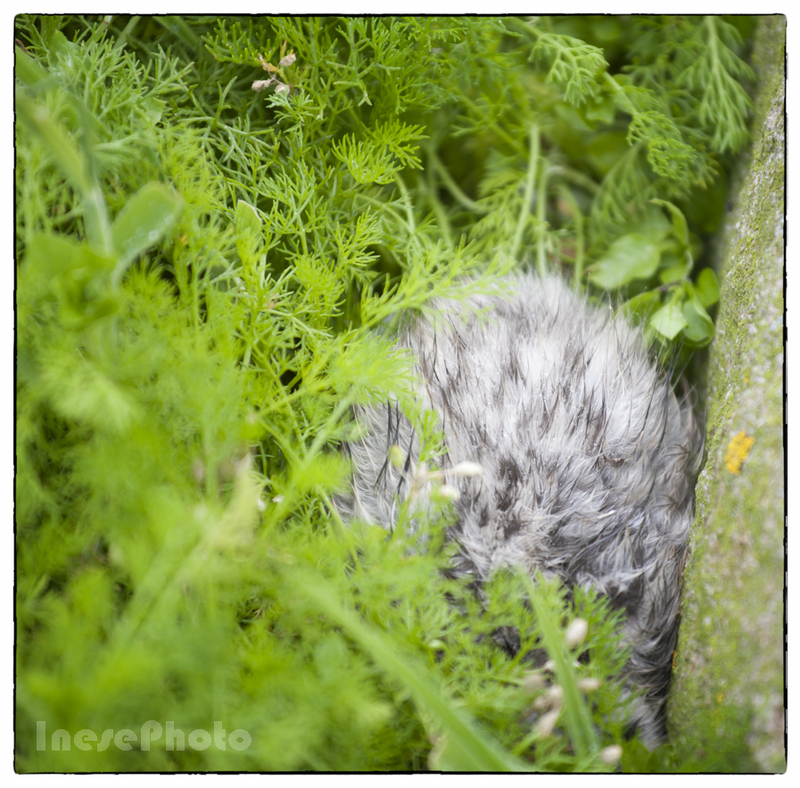 Even young bird or new hatch has instinct to hide from unknown. That is interesting. How could one resist not taking pictures of cute puffins and you had great captures of them. Haha Sarah, I hope nobody took a picture. I didn’t ask though. Helplessness, exactly. But I laughed a lot too. Ah, the puffins made me smile! I hate walking in overgrown vegetation too – turned ankles are no fun when you fall into a hole. Yes, exactly. 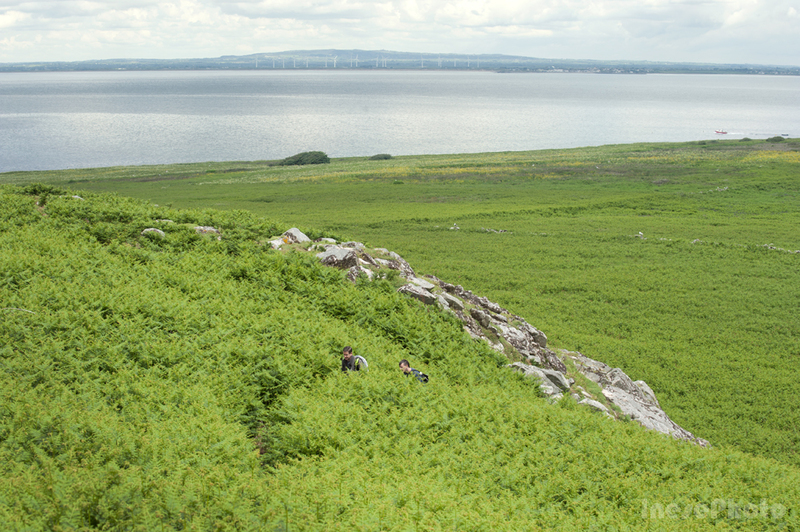 Good there was that 200 years old stone wall, otherwise it is just a sea of ferns that are quite high in June, up to your waist, at least. Beautiful, if a little dangerous off the path! I didn’t realise one of the gull family was on the endangered list. Thank you for stopping by! I din’t know either, because they are actually considered pests everywhere, but probably improved waste management in the cities cuts off their main food source, and diminishes their numbers. Thank you so much! 🙂 These are private islands, and the birds are well protected. No picnics, no dogs. You are super talented. Love seagulls and puffins. Thank you so much for your kind comment, Chris! Thank you so much Derrick! 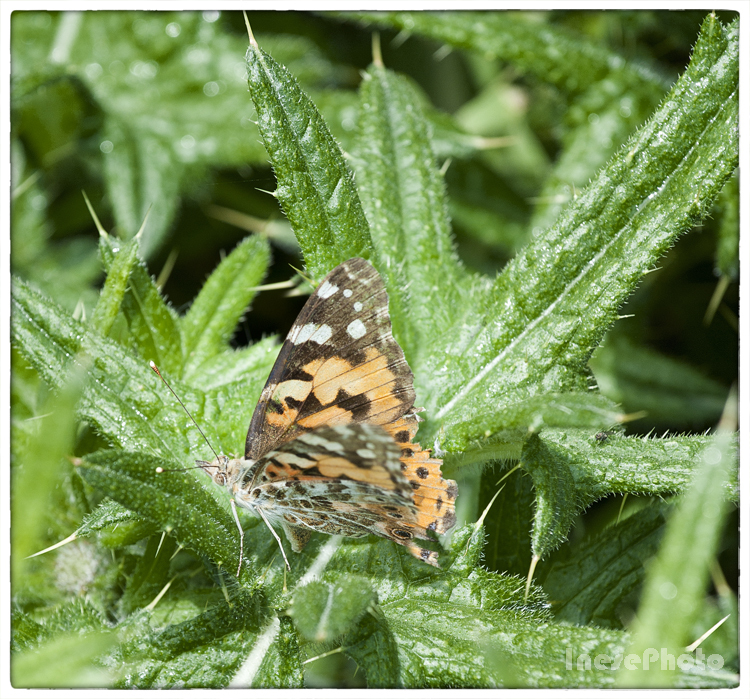 It was quite a distance and with a single point focus I got that effect. I have a short lens, 70-200, have to crop. The scenery is amazing, and usually I keep two pictures – the whole composition, and the cropped one. Oh Inese, they are the most beautiful birds, I love their way they seemed to be watching you. My favourite is the Shag, they are fantastic. An enchanting start to the weekend.